The Maiskogel is the ideal ski resort for families and all winter sports fans who appreciate the gentle terrain, local proximity and the cosiness of the traditional huts. Professional ski schools, ski rental and a generous ski depot at the valley station provide maximal comfort. Maximal fun however is guaranteed at the popular Alpine Coaster „Maisiflitzer“, or at the Fantasy Park. Skiing operation on Maiskogel again from December 2019. NEW from December 2018: Winter sports enthusiasts start their winter sports fun with the new MK Maiskogelbahn, a top-modern10-seater gondola lift, in the heart of Kaprun's centre. The new Stanger intermediate terminus opens a vast area for beginners around the Maisilift. A selection of several pistes is available in the area around the lift. 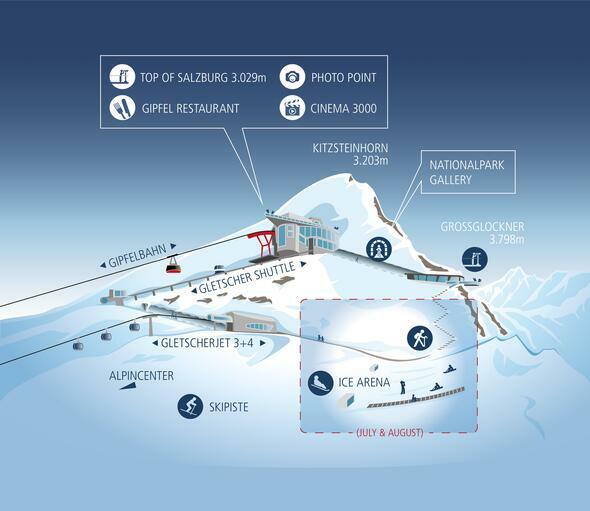 From Kaprun directly to the glacier: The dream of generations in Kaprun will come true in December 2019. The 3K K-onnection, Salzburg's first 3S-cable car, will connect the Maiskogel with the Langwiedboden in the glacier ski resort from December 2019. Purchase ski passes easily and conveniently online or directly at the ski pass cash desks. The Maisi Fantasy Park at the Maiskogel is the ideal springboard for all young freestylers who want to learn tricks in the snow park in a playful way. The Maiskogel is the right place for families! Young piste munchkins can make their first freestyle attempts on mini obstacles and across little jumps in the Phantasiepark. Wide pistes provide a great overview, a gentle practicing slope with button lift offers the ideal terrain for beginners and cosy huts invite to a well-deserved break after the first turns in the snow. If you are looking for a fun alternative to the pistes of the Maiskogel, then you will find a cool adventure at the all-year open Maisiflitzer: At the Alpine Coaster – a spectacular alpine roller coaster, you race downhill on rails even in winter. The ten rules of conduct for alpine skiers have been set out by the International Ski Federation and have become the benchmark for the proper conduct of alpine skiers around the world. Keep your eyes open: Look before you ski! Somewhere else, please: Do not stop at unclear points! Wear a helmet: If you got a brain, protect it! Keep cool: Open the lift bar only in the marked exit area! Everything under control: Recklessness goes before the fall. Breaks: Stopping for breaks increases the skiing fun! Service: Are your edges and bindings okay? Stop: Never enter closed off terrain. Warm up: A bit of warm-up reduces the risk of injuries. The future starts at the Maiskogel! NEW: MK Maiskogelbahn with comfortable 10-seater cabins from Kaprun to the Maiskogel top station & the new Kaprun Center – tickets, info, sports shop, ski depot, office.